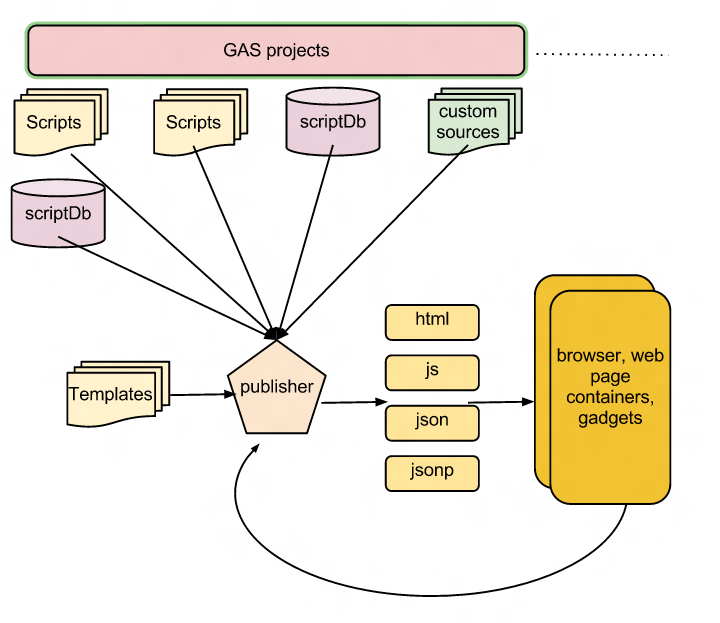 In Gas Publisher I described the detail of how the Gas Publisher works. Although most of the code is in the shared mcpher library, there is some set up you have to do in your own projects. There is no coding to do - just attaching to libraries and a bit of cut and paste. Here's the schematic again to remind you of what we are trying to do. This is the publisher that will be exposed publicly, and you need to publish as a web app. All requests will be dealt with through this single doGet(e) function. You can copy a ready made one from here. That will cover these steps. Remember that everything is case sensitive. Create default templates called js & html, or use the copied ones. I havent found out how to get the source of templates yet, so these are just pasted in. Attach any projects you want to access as libraries. You will need to create these functions (just copy them in as is) somewhere in every project that you want to be able to access from the publisher. This is because it needs to be able to get the scriptdb and scriptapp instance of the library it is reporting on and these are only accessible from the library itself. It will need these to exist to be able to access them. Create your own container script and host it on dropbox or somewhere if you plan to use gadgets for embedding. You should tweak the defaults to reflect the Url of your public app. Or, you can use my one and pass your url as an argument. See Gas Publisher and copy the example from there.